If you’re looking for an affordable, feature packed and intuitive glass cockpit for your general aviation aircraft then you should consider Aspen’s Evolution 2000. This flight display pair teams Aspen’s Pro PFD with its 1000 MFD, creating a system with MFD versatility, along with full PFD instrument redundancy. 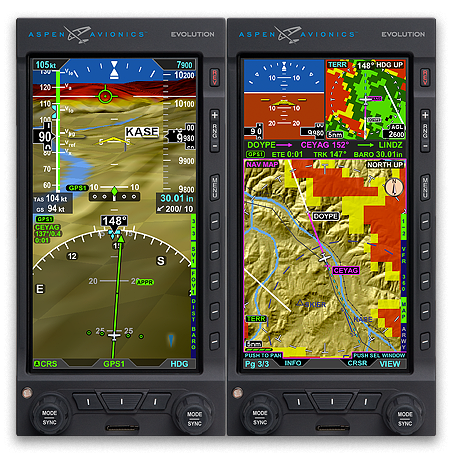 Aspen had safety in mind in putting together the Evolution 2000; it is currently the only GA EFIS display that provides total system redundancy for your aircraft, and all for a lower price than many rival units. With everything from full PFD capability built into the MFD, to dual redundant backup batteries, to a unique safety architecture that delivers a total backup ability that beats steam gauges, the Evolution 2000 will keep you in the air. With its complete system redundancy, this unit removes the requirement for heavy and often unreliable steam instruments. What’s more, with the PFD/MFD window layout this system provides you with the flexibility that you need to configure the displays to prioritise any critical flight data. With multiple views available at the touch of a button, your situational awareness will be vastly improved.